These photos were taken during our last visit to the lake where we used to spend our weekends in Korea. The gardener watering the plants. 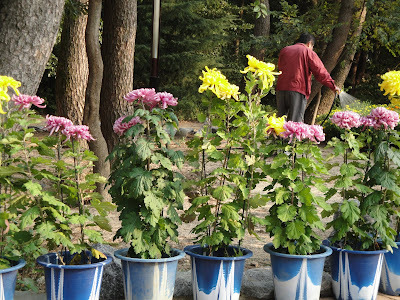 One thing that I admired about the South Korea is their passion in taking care their own people and environment as well. The government pretty much provide recreations and other amenities such as exercise equipment for their constituents. You can see different mulch on their gardens too. Isn't this a lovely landscape? 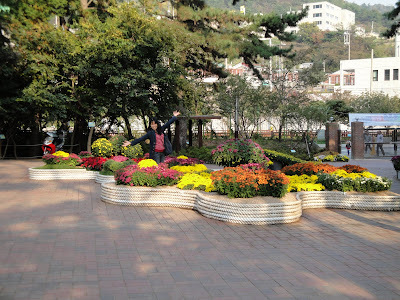 I am going to miss Korea because it is very refreshing to walk around, there are flowers everywhere you go. They are very good in gardening and decorating. Flowers can realy make your day happy. Here's my daughter imitating my pose lol. Since it is weekend, Rylie asked us if we could go to the lake and feed the fish again. She forgot that we are already in the mainland and not in Korea anymore. Having a laugh with my son. Thanks to everyone who visited during my absence, I missed blogging already hehehe. Have a great weekend to all. We are on 30's here so it is so cold outside. We might visit our close friend here in the neighborhood. She invited us for her father's death anniversary. naku sistah, parang ang tagal mo nawala, ilang days lang naman un, parang ang tagal. Na miss ka talaga sa blogworld..
We're all happy to hear that you and your family are now home safe. Merry talaga ang Christmas..Thanks ha, effort talaga comment mo...miss you sis!! Know what, almost same yata ang korea and japan.. Sana mag focus din ang government natin sa environment, sayang kasi. Have a nice weekends =) diba kayo homesick? nice landscape. Pagmay ganyan kami dito at our yard naku hehe ang ganda. Naku, mamimiss nyo nga ang Korea. Koreans are very disciplined and are sticklers for cleanliness just like the Japanese. Ang ganda naman nang pose mo sa harap ng mga flowers. Of all the flowers there, Rose pa rin ang pinakamatingkad at maganda, lol. Ginagaya ka nga ni Rye, like mother like daughter, lol. At si EJ pinaglihi yata sa sama ng loob, laging nakabusangot, lol. Pag laki niyan ay mawawala rin ang pagaka moody niya. Thanks for the wonderful post. God bless you all always. That is a beautiful garden, with gorgeous flower arrangements! Love it! Welcome back to blog land! At least you have the last glimpse of the beautiful garden in Korea! The blooms are so pretty! Keep your toes warm, hugs! Gorgeous shots of the flowers. 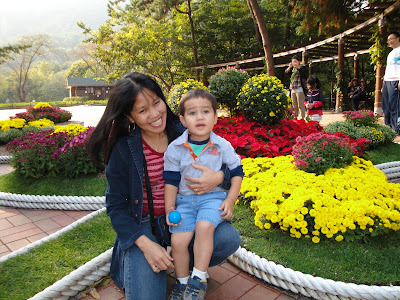 The landscapes are so beautiful and I love the shot of you and your son. That's a garden I would love to frolic in! Beautiful garden with so many beautiful flowers. Glad to know you and your family arrived safely. Beautiful garden arrangements I like it alot.Thanks for sharing all the lovely flowers. Beautiful flowers and the gardens are well kept. Beautiful series of pictures. It makes me more wanting to visit Korea. I like the landscape. And the flowers are all gorgeous. That is one incredible garden. I like all the flowers. It's really beautiful and lovely. wow ate! ang ganda naman dyan! enjoy na enjoy! have a great week! This is something worth missing. Super ganda ng place. A delightful series of photos. Thanks for sharing them. Beautiful photos. Your children are precious. Rose, I know that you'll miss South Korea, but I hope that your new home will be a happy one. Happy Blue Monday. 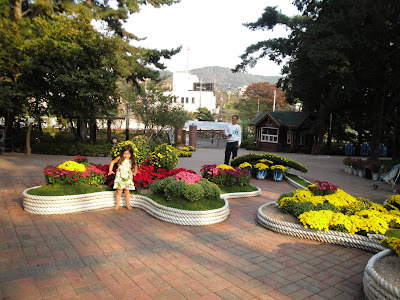 The flowers are beautiful and it looks like you are having a great time with your children! Glad to see such beauty in a land that you love. The garden and flowers are lovely. If you do not have many where you are now, you still have the beautiful memories of Korea. Oh they are very pretty flowers. happy blue Monday? The gardens are really lovely Rose. I know you'll miss them, but your new home will offer much as you become use to it. I hope you are having a wonderful Blue Monday and are looking forward to the Christmas holiday. those are great captures sissy! 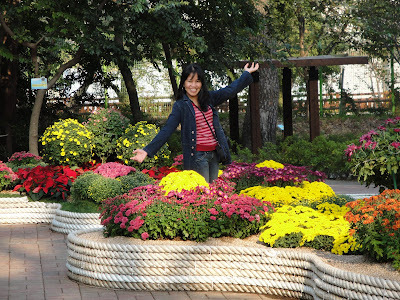 What LOVELY colorful flowers in this beautiful garden! You look so happy. I tried to come earlier, but something went wrong...here I am. Love all your pretty pics. Happy Blue Monday, my son was in Korea last summer, he was 15 years old and loved it all. The flowers are all pretty pati na yang isang babae na nag posing diyan, Rose yata ang name niyan is equally beautiful mana sa anak. baligtan na ngayon bakla ang nanay na mana sa kagandahan ng anakins. Nice touch of color blue there..and i guess by just looking at the pictures..its such a nice place.